Sporotrichosis can mimic a few diseases. Sporotrichosis presenting as a hypoaesthetic plaque or plaque suggestive of leprosy has not been mentioned in literature. Herein we present a case of a 26 years old man who presented with hypoesthetic plaque on left ankle and was clinically diagnosed to have borderline tuberculoid leprosy who later developed few nodules in linear fashion on left leg, which ruptured to form non healing ulcers. Culture from ulcer grew Sporothrix schenckii. Patient was successfully treated with oral potassium iodide. 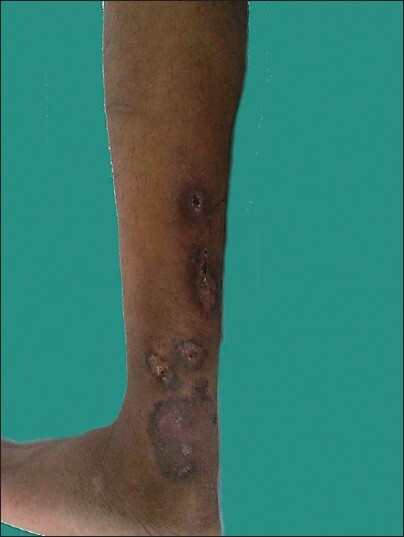 Sporotrichosis as well as leprosy can present in various forms. Sporotrichosis has been reported to present as plaques, nodules and ulcers. Leprosy also presents as hypoaesthetic macules, plaques as well as nodules. Sporotrichosis initially presenting with only hypoaesthetic plaque and later developing nodules caused diagnostic difficulty in our patient. Sporotrichosis usually presents as multiple nodules in linear fashion. It may show fixed plaque like lesions which may ulcerate. Leprosy is a disease having variable presentations like hypopigmented, hypoaesthetic plaques to nodules of Hansen's disease (LL) and erythematous tender nodules of erythema nodosum leprosum (ENL). Few case reports have shown occurrence of nodular lesions in sporotrichoid fashion either in a case of lepromatous leprosy or as nerve abscesses in upgrading reaction of borderline tuberculoid (BT) leprosy. ,, Sporotrichosis presenting as a hypoaesthetic plaque resembling leprosy is not mentioned in literature. Our patient presented with single hypoesthetic plaque on left ankle which appeared like plaque of BT leprosy. In a period of one and half months, he developed few linear nodules starting few cm away existing plaque. 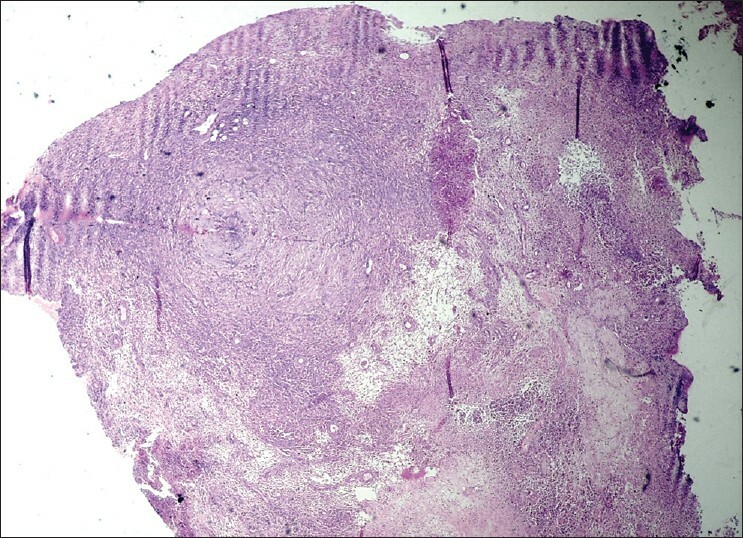 Culture and histopathology from nodular lesions showed evidence of sporotrichosis. 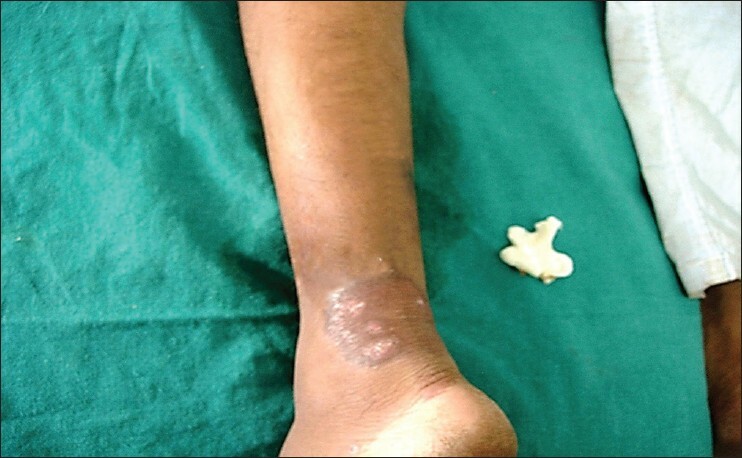 A 26-years-old male, resident of Kolhapur, Maharashtra, presented with a hypoaesthetic plaque on the posterior aspect of left ankle of 6 months duration. There was no history of penetrating trauma/similar lesions anywhere else on the body. There was no history of oedema/constitutional symptoms/pain in the limbs/motor weakness/deformity i.e., there was no evidence of lepra reaction. For these complaints patient had shown to a dermatologist. Patient was diagnosed clinically as a case of Hansen's disease and started on anti-leprosy treatment, without undergoing skin biopsy and slit skin smear examination. General and systemic examination was unremarkable. Dermatological examination revealed a single, well defined hyperpigmented annular plaque of size 8 × 6 cm in size, which was dry, hypoesthetic [Figure 1]. There was no nerve thickening close to the patch. There was no significant peripheral nerve thickening. No motor deficit or deformity was noticed. Haematological and biochemical investigations did not reveal any abnormality. Slit skin smear did not show lepra bacilli. Skin biopsy showed thickening of epidermis, periappendageal lymphocytic infiltration. No perineural infiltration/granuloma/lepra bacilli were seen. Though histopathology was not confirmatory of Hansen's disease, but the presence of a classical borderline tuberculoid like plaque inclined us to continue anti-leprosy treatment, considering Hansen's disease to be one of the commonest causes of hypoaesthesia. The differential diagnoses of lupus vulgaris and annular sarcoidosis were considered but histopathology was non confirmatory and other supportive investigations like chest X-ray, serum Angiotensin converting enzyme levels, serum Elisa test for Mycobacterium tuberculosis d not reveal any abnormality. Two weeks later, patient developed a painful nodule, few cm away from the existing plaque. It resembled a furuncle and patient was started on oral and topical antibiotics. The nodule did not regress in size and ultimately ruptured to form an ulcer. 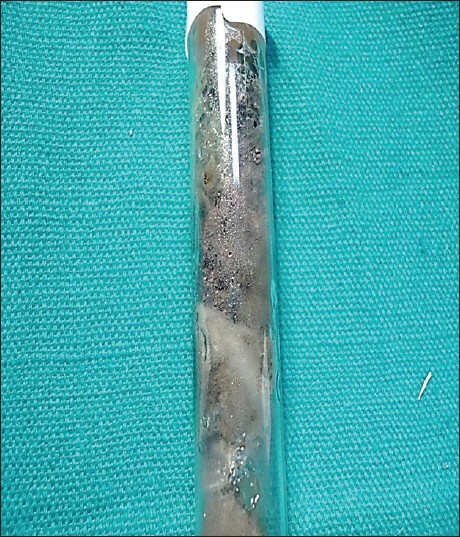 The ulcer had well defined, hyperpigmented margins, sloping edges, with pale granulation tissue and yellowish necrotic slough on the floor. Pus from ulcer was sent for culture and sensitivity and patient was started on appropriate oral antibiotics. However the ulcer did not heal. In next three weeks, patient developed three more such nodules in linear fashion which ruptured to form non healing ulcers [Figure 2]. We considered differential diagnoses of sporotrichosis and atypical mycobacterial infection. 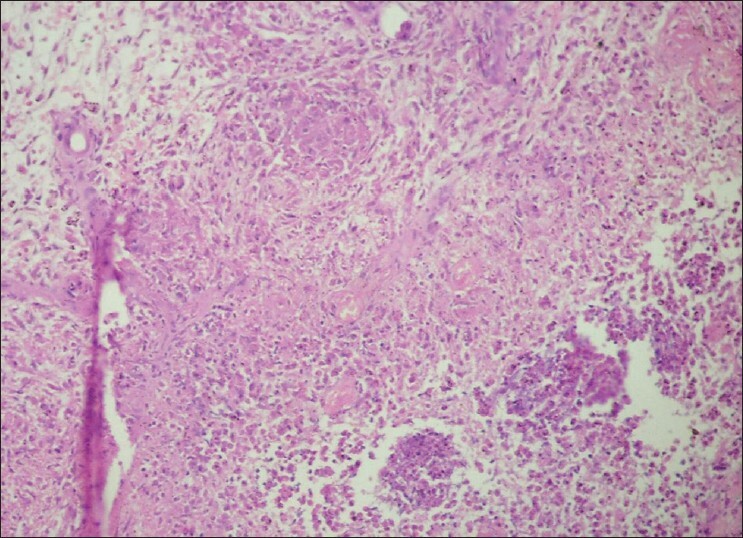 Histopathology from ulcer tissue showed granuloma formation [Figure 3] with multiple neutrophilic microabscesses and eosinophils [Figure 4]. 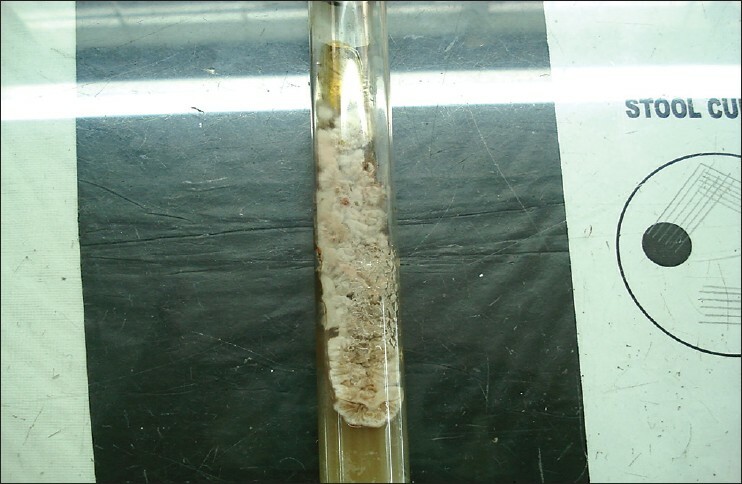 Cigar shaped fungal element were detected on periodic acid schiff (PAS) stain [Figure 5]. Pus culture from ulcer showed growth of Staphylococcus aureus. Culture of ulcer tissue showed creamy white, waxy colonies which later turned greyish black in color [Figure 6] and [Figure 7]. 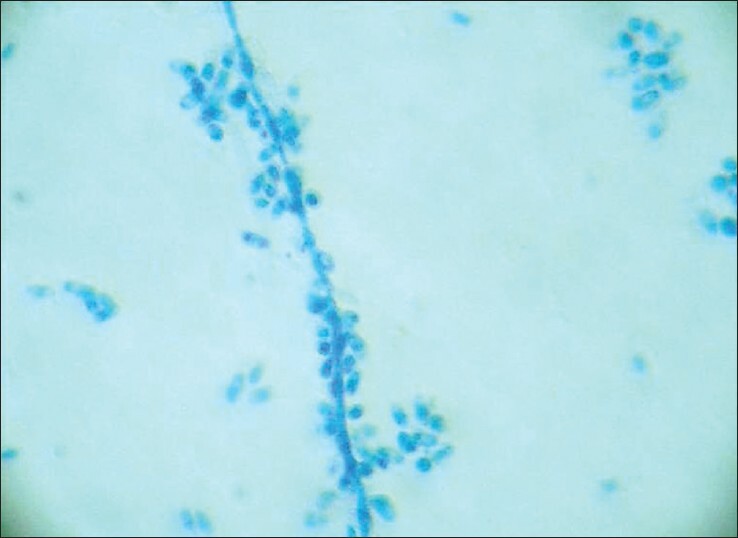 The lactophenol cotton blue (lcb) mount from colonies showed small oval conidia and hyphae of Sporothrix schenckii [Figure 8]. The organism converted to yeast phase on incubation at 37°C on brain-heart infusion agar. Thus final diagnosis of sporotrichosis was reached. After investigating him for thyroid hormone assay, serum electrolytes and ECG which were within normal limits, patient was started on oral potassium iodide therapy as per our institution's preference based on experience. He was started on five drops of potassium iodide, given with milk, three times a day with an increase of one drop thrice a day. Patient started showing improvement when he was taking forty drops thrice a day [Figure 9] which we continued for 6 weeks till he showed significant clinical response and started tapering by one drop thrice a day till five drops thrice a day and stopped the therapy. At present all the ulcers have healed. There is no recurrence of lesions 1 year after stopping the therapy or no side effects of oral potassium iodide therapy have been observed in this patient [Figure 10]. The other form of sporotrichosis is fixed cutaneous type in which erythematous, crusted or ulcerated plaques are seen at the site of trauma and do not involve local lymphatics. Mucocutaneous, pulmonary and disseminated forms are also seen. However no case has been reported where sporotrichosis presented as a borderline tuberculoid leprosy like plaque. Though plaque like sporotrichosis is seen in fixed cutaneous variety, but it is usually crusted or ulcerated erythematous plaque and not a hyperpigmented, hypoesthetic plaque as seen in our patient. Whether the hypoesthesia in this patient was due to induration in the plaque or due to destruction of superficial nerves in the inflammation process caused by localized infection is not clear. Occurrence of new lesions, different than the existing lesions should arouse the suspicion of a different diagnosis. Uncommon presentations of a known disease can cause difficulties in diagnosis and thus delay the accurate treatment. Efficient laboratory services are needed in such cases. 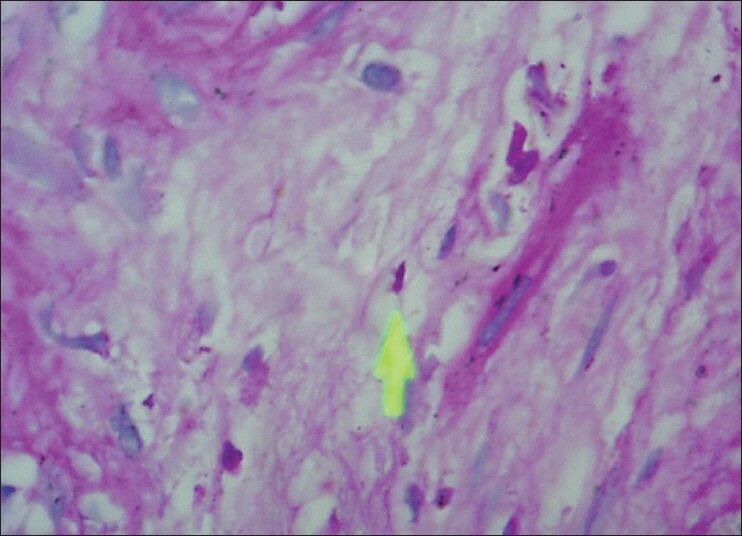 Sporotrichosis or lupus vulgaris may appear as a hypoesthetic plaque mimicking a BT leprosy lesion. 1. Roderick J Hay. Deep fungal infection: Sporotrichosis. In: Wolff Klaus, editor. Fitzpatrick's Dermatology in General Medicine. 7 th ed. Vol. 1. USA: The Mc-Graw-Hill companies; 2008. p. 1831-2. 2. Mehta SD, Handa U, Dawn G, Handa S, Kaur I. Borderline lepromatous leprosy masquerading as lymphocutaneous sporotrichosis. Lepr Rev 1995;66:259-61. 3. Ramesh V, Beena KR, Mukherjee A. Sporotrichoid presentations in leprosy. Clin Exp Dermatol 2000;25:227-30. 4. Ghorpade A. Multiple superficial sporotrichoid nerve abscesses with a hyperpigmented lesion in a tuberculoid leprosy patient: A rare and unusual presentation. J Eur Acad Dermatol Venereol 2006;20:357-8. 5. Venugopal PV, Venugopal TV, Abirami CP. Deep fungal infections. In: Valia RG, editor. IADVL Textbook of Dermatology. 3 rd ed. Vol. 2. Mumbai: Bhalani Publishing House; 2008. p. 304-6. 6. Ramesh V, Singh A, Pahwa M, Capoor M. A recalcitrant facial plaque: Fixed cutaneous sporotrichosis. Int J Dermatol 2011;50:367-8. 7. Mahajan VK, Sharma NL, Shanker V, Gupta P, Mardi K. Cutaneous sporotrichosis: Unusual clinical presentations. Indian J Dermatol Venereol Leprol 2010;76:276-80. Sporotrichosis presenting as a hypoaesthetic plaque resembling leprosy is an unusual finding which was present in our case. An alternate differential diagnosis should always be thought of in all conditions as an unusual presentation of a disease can cause diagnostic dilemma and delay in treatment. Adjuvant histopathological, microbiological and immunological investigations are necessary in confirming diagnosis in such cases.